Mark Schwartz may be the most accomplished shoe designer/artist that you've never heard of. A 28 year veteran of the footwear business, Schwartz made his mark as chief designer for Roger Vivier in the '80s as well as becoming an apprentice of Andy Warhol who one day "appeared on my doorstep" aka walked into the Madison Avenue store to meet him. Vivier knew Warhol and arranged the introduction whereupon the pop artist encouraged Schwartz to paint shoes on canvas "I was using oil pastels or crayons then rather than watercolors and ink" Schwartz said. "We used to paint shoes together." 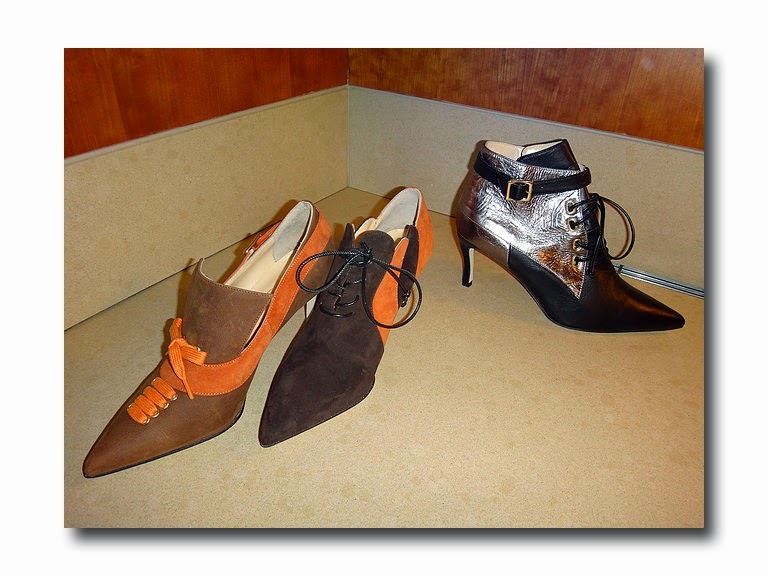 Yes, I had all but forgotten that Warhol started his career as a shoe illustrator for I. Miller. 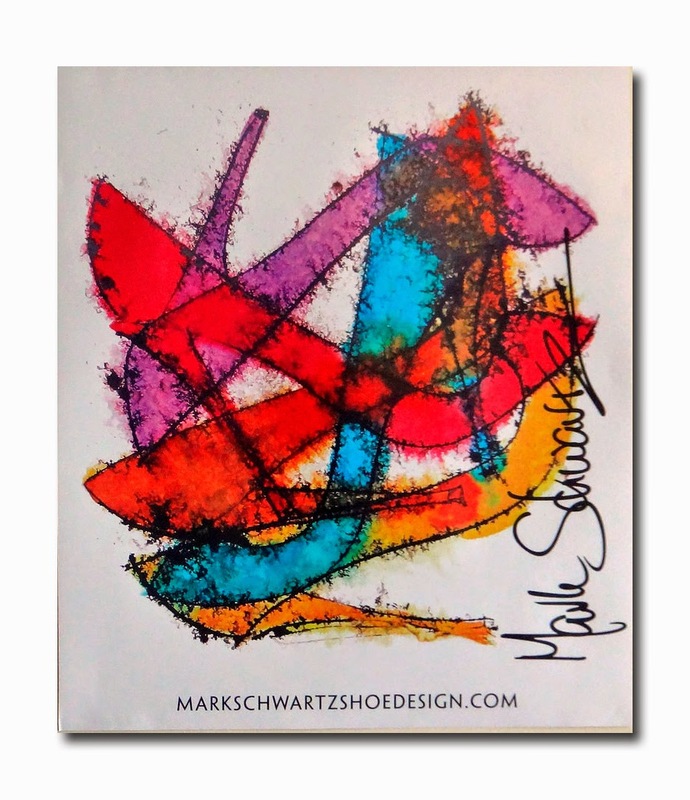 See video of Mark Schwartz painting: markschwartzshoedesign.com . After six years working for Vivier and following the death of Warhol (Schwartz knew him for the last two and a half years of his life) Schwartz moved to Paris for a few years and designed shoes for designers such as Ralph Lauren, Gucci, Dior, Balenciaga, and Hermes. 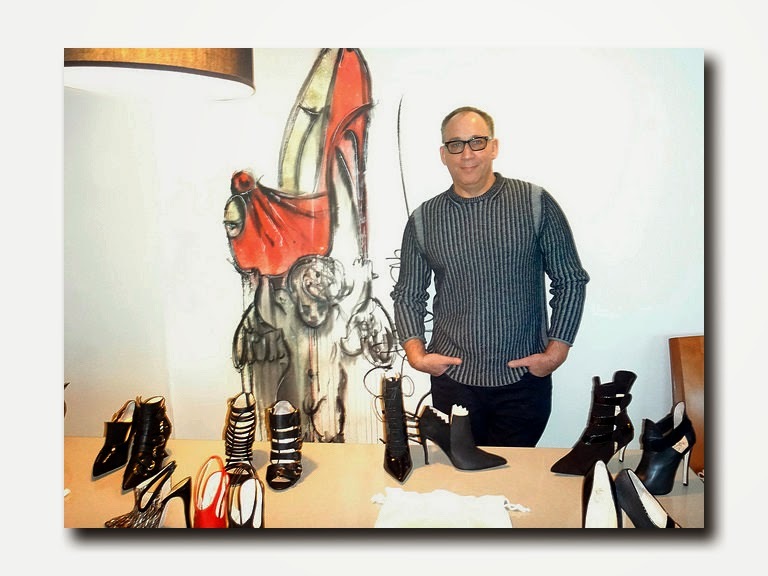 His shoes have been featured in major fashion publications such as Vogue, Elle and W. Schwartz is currently in town for the NY Fall 2015 Shoe Expo trade show as he prepares to re-launch his collection which had taken a backseat to his painting in recent years. In the mid '90s, Schwartz had a shoe store in Soho that was suffering from bare walls. He decided to put his shoe paintings on display and instantly found they began selling just as well as the shoes. The Bronx native moved to Tampa, Florida with his family after 9/11 but spends much of his time here. He also travels as much as twice monthly to his factory outside of Milan, Italy. Upon entering the presentation suite at Le Parker Meridien where he is seeing press I am initially mortified as I managed to interrupt his lunch. I caress the shoe with the most personality of the collection titled "Sorriso" (Smile in Italian) which, for some reason, makes me think of the animated movie "Cars" with its anthropomorphic faces. 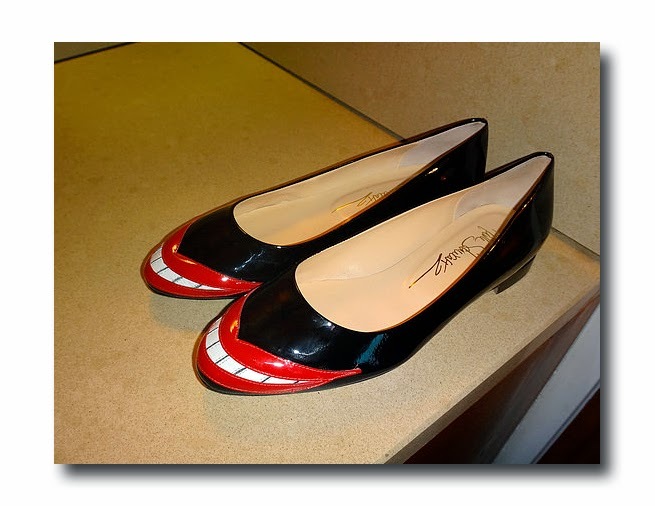 The round toe box of the black pump is the front bumper and the toothy grin gives it a playful yet surreal look. I'd definitely like to take them for a test drive. After all, how could you possibly be in a bad mood if you looked down and saw something so amusing on your feet? These cheery shoes will retail for about $595 and come in a flat version as well. 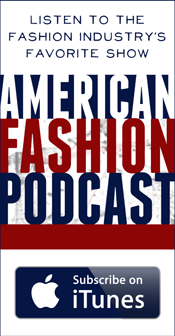 No word on which stores will be carrying the line yet...think high-end retailers such as Saks and Bergdorf Goodman. Many of the shoes have a slight wave or curve to the heel which may be a nod to Vivier who pioneered the slanted "Comma" heel. Materials range from suede, metallic leathers, pony skin animal print and kid in various colors, heel heights, toe widths (I notice the pointy toe is back) and many closely resemble either Manolo Blahniks or Christian Louboutins (both designers who Schwartz knows and admits to paying homage to). Other than the "Sorriso" they are not designed to be gimmicky like Sophia Webster or Charlotte Olympia and there are no platforms in sight. I would describe them as very ladylike shoes (read not for pounding pavements) or "classic with a twist" as Schwartz likes to call them. I didn't get to judge their comfort as I am not a sample size 37 however I did pose holding the Smile shoes for the record ie. social media. 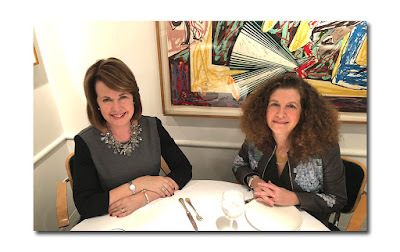 Schwartz counts many celebrities as his clients including Julia Louis-Dreyfus, Sharon Stone, Madonna, Lady Gaga, Julia Roberts, Katie Couric and Oprah who commissioned shoes for her 50th birthday party from him and owns a few wall paintings as well. 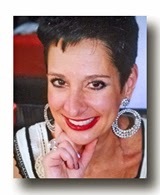 Interestingly, one of my favorite Oprah attributed bon-mots is "I still have my feet on the ground. I just wear better shoes." I'll bet she was referring to Mark Schwartz's designs when she made that statement.